Versatility: enterprise ability to adapt business processes to changing environments without having to change architectures. Plasticity: enterprise ability to change architectures without affecting business processes. Combining versatility and plasticity requires a comprehensive and consistent view of assets (architectures) and modus operandi (processes) organized with regard to change. And that can be achieved with model based systems engineering (MBSE). Agility is all about change, and if enterprise governance is not to be thrown aside decision-making has to be supported by knowledgeable descriptions of enterprise objectives, assets, and organization. Actual (business context and organization) or symbolic (information systems). 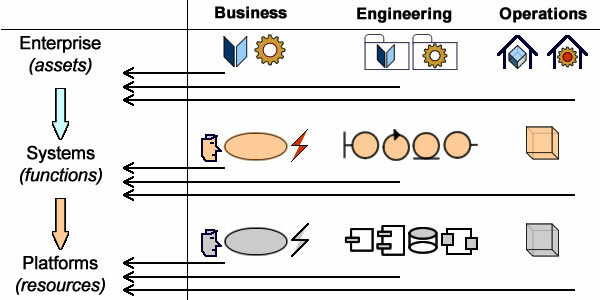 Objects (business entities or system surrogates) or activities (business processes or logic). Dependencies between operational and structural elements. 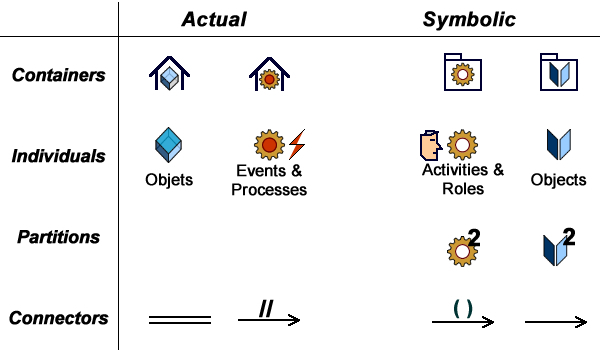 Dependencies between actual assets and processes and their symbolic representation as systems surrogates. Versatility and plasticity will be obtained by managing changes and alignments between settings. Looking for versatility, changes in users’ requirements must be rapidly taken into account by applications (changes from actual to symbolic). Looking for plasticity, changes in business objectives are meant to be supported by enterprise capabilities (changes from operational to structural). The challenge is to ensure that both threads can be weaved together into business functions and realized by services (assuming a service oriented architecture). That would make agility a concrete endeavor across enterprise, from business users and applications to business processes and architectures capabilities. Assuming patterns are meant to chart the path from problems to solutions, and given the foundational contribution of the Gang of Four (GoF), it may help to look at functional (aka representation) patterns backward from the perspective of the now well established solutions framework (aka design patterns). Functional patterns deal with the representation of business objects and activities by system symbolic surrogates. They stand between computation and platform independent models. 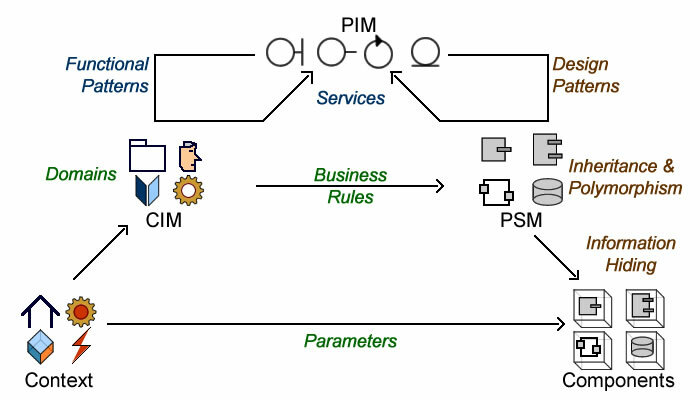 Whereas functional patterns are not to be confused with business patterns (used with CIMs), they are also known as analysis patterns when targeting PIMs. Design patterns deal with the implementation of symbolic surrogates as software components. They stand between platform independent and platform specific models. 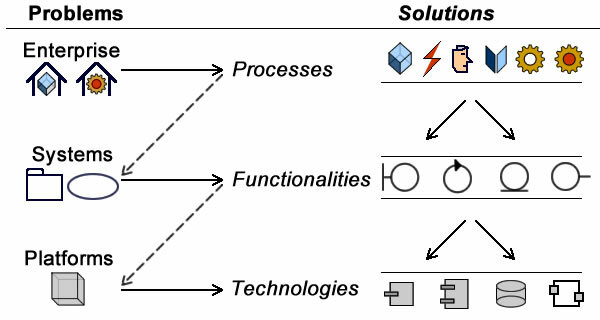 As it happens, there is a striking contrast between the respective achievements for design and functional (or analysis) patterns, the former, firmly set up by the pivotal work of the GoF, is nowadays widely and consistently applied to software design; the latter, frustrated by the medley of requirements capture, remain fragmented and confined to proprietary applications. Given that discrepancy, it may be worth to look in the rear-view mirror and consider functional patterns from the perspective of design ones. Whereas the meaning of classes, implementation, and inheritance is specific to OO design, the principles can nonetheless bear upon analysis providing they are made to apply to types and composition, whose semantics have a broader scope. 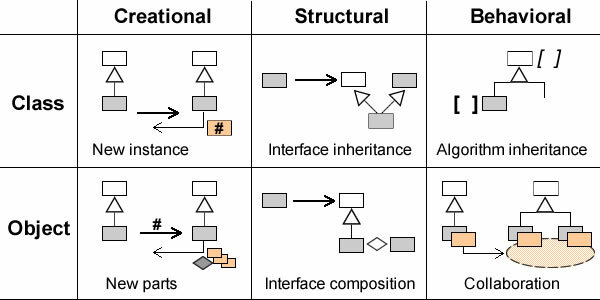 To begin with, if classes describe the software implementation of symbolic objects, and inheritance the relationships between them, types only pertain to their functional capabilities. As a corollary, the semantics of inheritance and composition makes no difference with regard to types, as opposed to classes. The lesson for functional patterns would therefore to favor types whenever possible, i.e when functional capabilities doesn’t depend on identities. Then, “programming to interfaces” would translate (for functional patterns) into describing communications between types. That approach being best represented by aspect oriented analysis. Not by chance, the lessons drawn above appear to be directly supported by the two criteria used by the the GoF to classify design patterns: scope and purpose. With regard to scope, class patterns deal with inheritance relationships between static descriptions fixed at compile-time, while object patterns deal also with relationships between instances which can be changed at run-time. 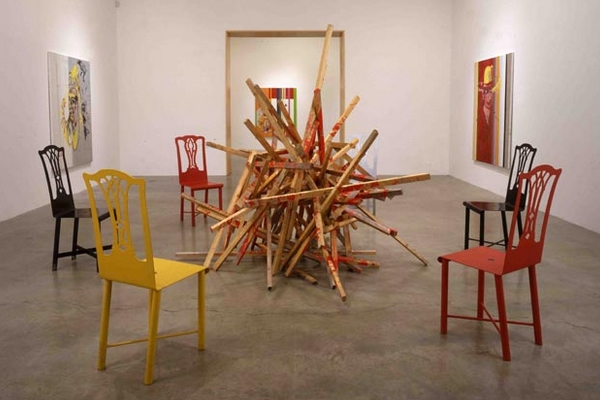 With regard to purpose, creational patterns deal with objects instanciation, structural ones carry on with composition, and behavioral ones with algorithms and responsibilities. Class/Creational: for new identified instances. Object/Creational: for new parts of identified instances. Class/Structural: for mixing interfaces using inheritance. Object/Structural: for mixing interfaces using composition. Class/Behavioral: for the definition of algorithms. Object/Behavioral: for the collaboration between instances. The next step would be to induce a catalog of functional patterns from those entries. Leveraging the GoF’s design patterns, the objective is to spread the benefits upstream to the whole of the modeling process through a transparent mapping of functional and design patterns. And that could be achieved by inducing a functional catalog from its design equivalent. With regard to scope, the objective would be to factor out the architectural impact of requirements. Hence the distinction between architecture patterns dealing with business entities and processes consistently identified at enterprise and system levels, and aspect patterns dealing with features that can be managed separately. With regard to purpose the same semantics can be applied: creational patterns deal with objects instanciation, structural ones carry on with their composition and features, and behavioral ones with algorithms and responsibilities. Architecture/Creational: for the mapping of business entities to their software surrogates. For instance, customers must be identified as parties (architecture/creational) before being fleshed out with specific features. Aspect/Creational: for the intrinsic components of identified business entities. For instance, once created and identified as a customer, a foreign one is completed with the specific mandatory features of foreigners. Architecture/Structural: for inherited (i.e intrinsic) features of identified business entities. 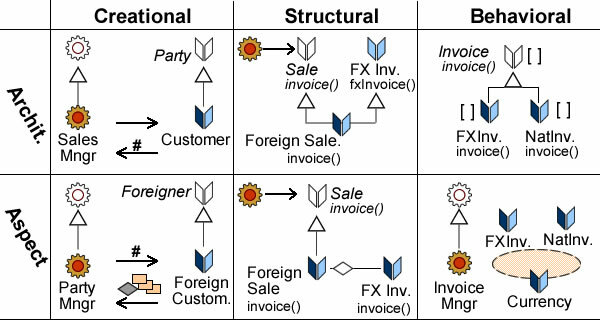 For instance, foreign sales inherit specific invoice features. Aspect/Structural: for associated (intrinsic or otherwise) features of identified business entities. For instance, foreign sales delegate invoicing in foreign currencies. Architecture/Behavioral: for the definition business rules attached to entities and managed by business domains. 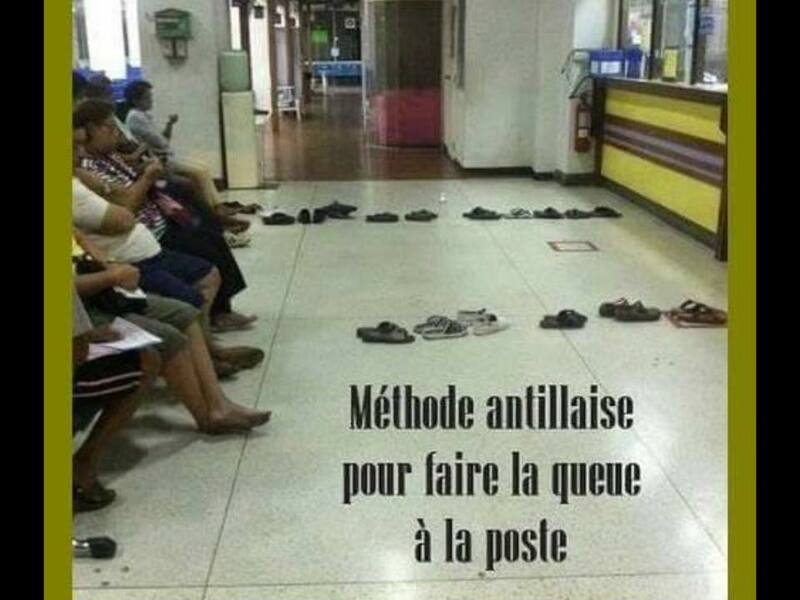 For instance invoicing rules are specialized for foreign currencies. Aspect/Behavioral: for the definition of collaboration between entities independently of business domains. For instance allocating responsibilities at run-time depending on the invoice. As can be seen with the MDA diagram above, this catalog is neutral as its entries are congruent with the categories used by the main modeling methodologies : use cases, domains, business rules, services, objects, aspects, etc. Gamma E., Helm R., Johnson R. and Vlissides John M. , “Design Patterns: Elements of Reusable Object-Oriented Software”, Addison-Wesley (1994).